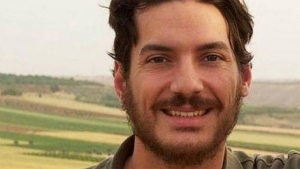 Austin Tice is a journalist who was taken in August 2012 while covering the conflict in Syria. Robert O'Brien, the Trump Administration's point person for hostage affairs, will update reporters on the case of kidnapped journalist Austin Tice on Tuesday at 10:30 a.m. at the National Press Club in the Murrow Room. The Club and the Free Austin Tice Coalition, which includes The Washington Post, McClatchy, Reporters Without Borders, and Georgetown University, will announce the details of a new project, "Night Out For Austin Tice." Tice, a freelance journalist, was kidnapped in August 2012 while covering the conflict in Syria. The U.S. government has said it believes Tice is being held by the Syrian government or its allies. The FBI in In April offered a $1 million reward for information leading to Tire's safe return. The coalition is working to double the reward money for actionable information. During the "Night Out For Austin Tice" on May 2, restaurants across the city and around the country will contribute a portion of their proceeds to the reward fund. The date is the evening before World Press Freedom Day. The fund will be kept at the National Press Club Journalism Institute, the Club's 501c-3. The goal is to raise $1 million to match the FBI reward and for Tice's safe return. The Club and its partners will hold regular updates to discuss the number of restaurants added and how the project is progressing in different markets. In each participating restaurant, the partners will provide educational materials that describe Tice and his background as an Eagle Scout, GU law student, US Marine Corps veteran and award-winning journalist to help Americans better understand who journalists are and the kinds of danger they sometimes face to keep the public informed. Speakers at the briefing include O'Brien, U.S. Special Presidential Envoy for Hostage Affairs, Tice's parents Marc and Debra Tice, Club President Andrea Edney, Craig Forman,  CEO of McClatchy, Margaux Ewen, North American director, Reporters Without Borders and representatives of The Washington Post and Georgetown University. O'Brien will give his first public remarks about U.S. efforts to release Austin Tice since being named U.S. Special Envoy. Marc and Debra Tice will discuss their ongoing efforts to secure Austin's safe return, including their upcoming trip to the region and request for a Syrian visa. Tice, a graduate of Georgetown, had just finished his second year of law school when he went to Syria to report on the conflict there. Georgetown students and leadership have been active in volunteering time and energy to work on projects related to Austin's safe return. Reporters Without Borders has played a leading role advocating for Austin's release through creative programs including an ad campaign on more than 260 US media websites produced by advertising giant JWT. In 2015 the Club honored Austin Tice with the John Aubuchon Press Freedom Award. The Club, through its Journalism Institute, advocates for Press Freedom worldwide including the case of Jason Rezaian and the ongoing case of Emilio Gutierrez-Soto. For more information, contact Bill McCarren, 202-662-7534.